[Review] 4 Elements HD (PS3) | Denkiphile. We Like Games. The game takes you to a simpler and mythical time. A world that is comprised of fairies, some green stuff called energy, and four elements. 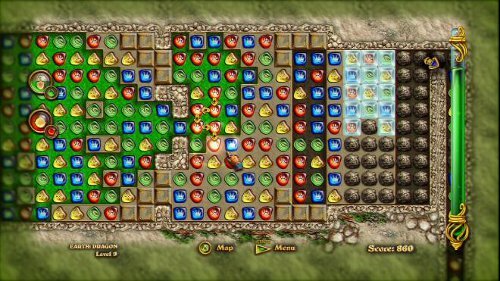 The four elements comprise of your puzzle pieces which look similar to the layout of Bejeweled. The difference is the objective of the game. At one end of your screen you have “energy” and it’s your job to have it travel across the screen to the altar. You accomplish this task by clearing chains of three or more same elements that hollow out the underneath portion of the map, allowing the energy to flow freely. For the first couple of levels, the maps are fairly simple and small in size but before long, you will be in more intricate maps that take up a size larger than your screen and you’ll have to travel along a much greater distance to reach the alter. Every part of the game is extremely defined and is great to look at. Menu transitions, floating text, and the music all compliment the experience and gameplay very well. The only gripe I would have visually is that some of the text is small and difficult to read – especially hints that would be given to you by your fairy friend. It became such a hassle that I would just skip the dialogue and try to figure it out on my own. The gameplay seems fairly easy at first but it does become more intricate as the maps get bigger and you start to face new obstacles such as frozen blocks, stones, slabs and multilevel ground that require multiple , and you begin to discover new ways to get around all of these obstacles. Instead of using a straight line to get from A to B, you need to circumvent these obstacles or attack them straight on to ultimately reach your altar. There will be times when there is only one way out of an area but there is a stone in the way that cannot be broken unless you find an arrow to shoot energy through and break the stone. Another feature the makes the gameplay unique is the Playstation Move support. This way the game becomes more tangible and the controls become more fluid than just controlling it with the joystick or D-pad. If you’re a fan of puzzle games and you have invested in Playstation Move then this game really is a must. If you do not own Playstation move, 4 Elements HD is still a great puzzler that should not be overlooked. Make sure you look out for it in the Playstation Store and be ready to race to get the fastest times and high scores. See you on the leader boards! I live in an  world. Posted on September 11, 2011, in PS3, Puzzle Games, Reviews, Single-Player, Uncategorized and tagged 4 Elements HD, Boolat Games, PS3, PSN, Puzzle Games, Reviews. Bookmark the permalink. Leave a comment.